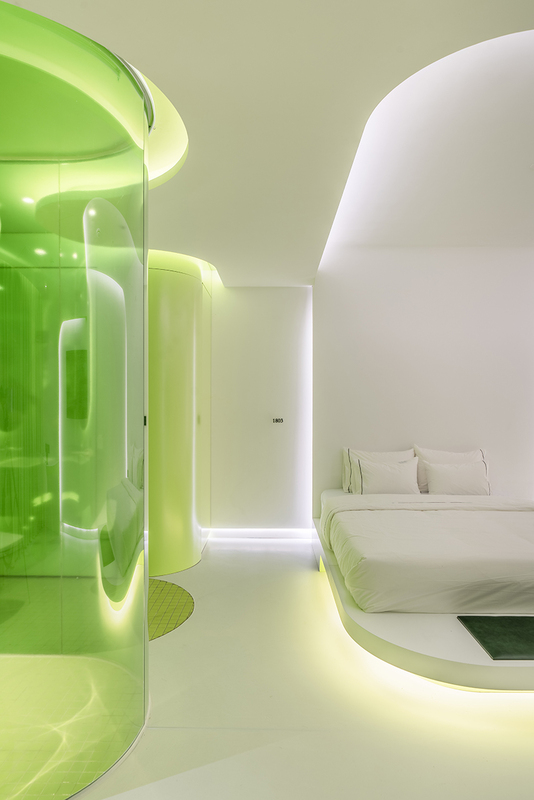 Colorful lime-green transparent panels are used to separate rooms in this newly-designed hotel suite by Seoul-based architecture practice SML. 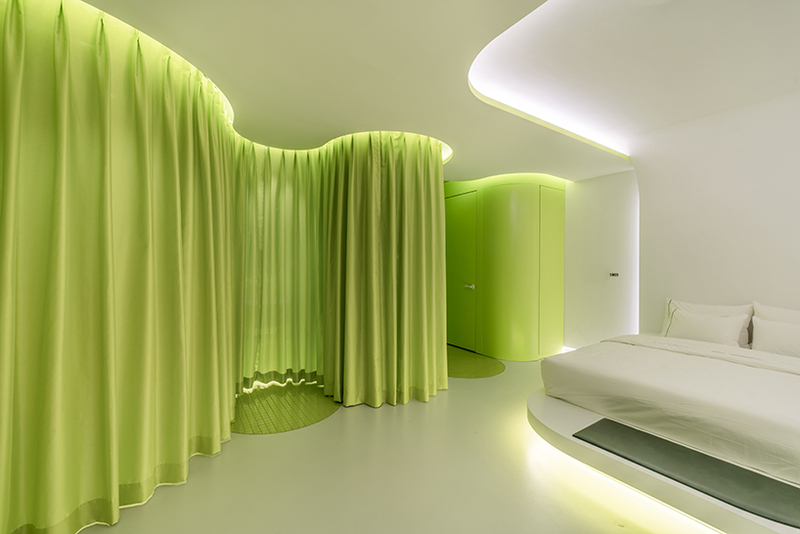 Aside from the bathroom, which is covered with curtains, each room is viewable by the naked eye but encapsulating in the vibrant color. Futuristic and captivating, the setting features fillet corners, cove lights and and a levitating bed. 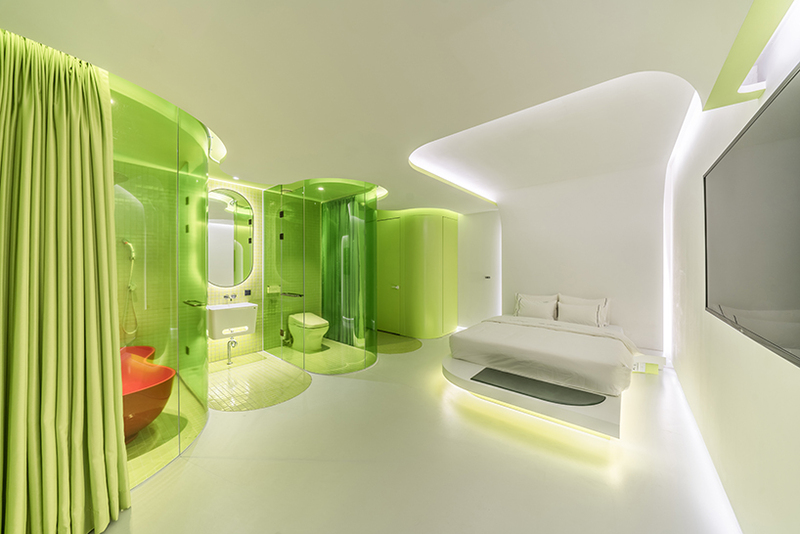 The entire suite becomes more like the inside of an out-of-this-world spaceship in a sci-fi film. 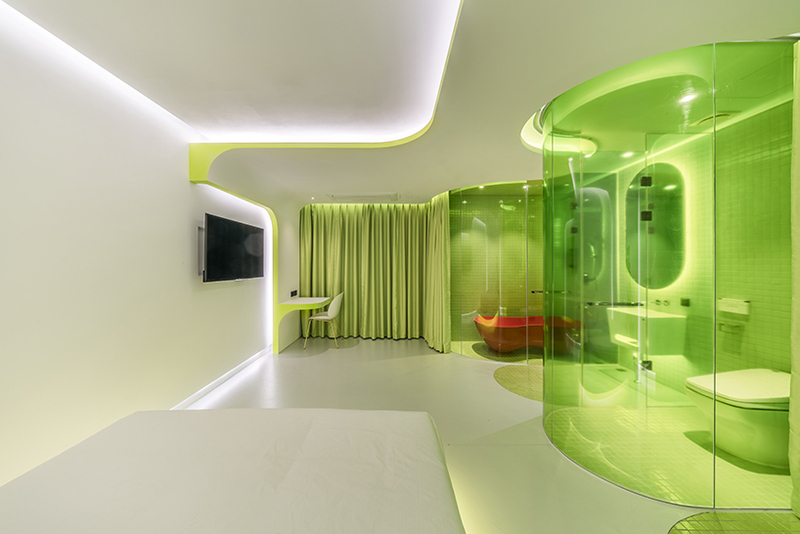 The room itself is rectangular but the curved dividers with rounded corners creates a vacuum oval-shaped oasis by playing with the guests perception. 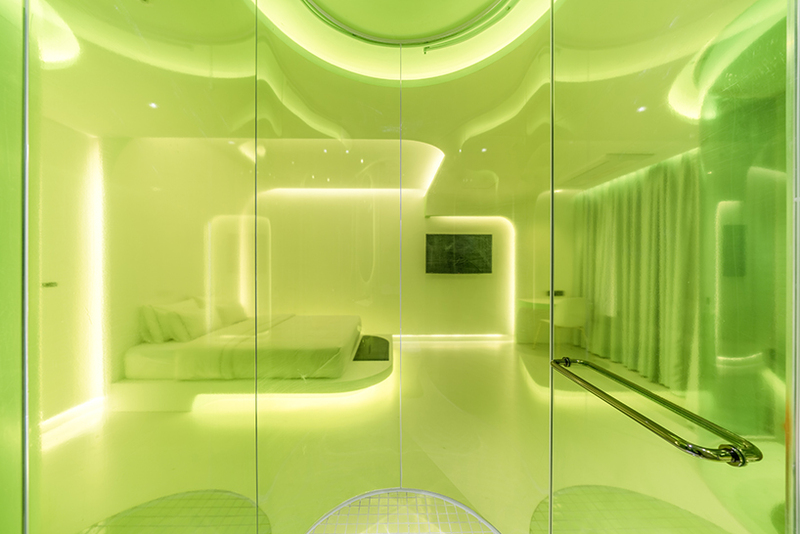 The bed, pure white from head to toe, is set on a suspended podium illuminated from underneath and behind with lights, hidden behind the floating ceiling contrasing beautifully with the vivid lime-green partitions. Across the room, a group of four tiled “petals” of a similar lime color on the floor, which define four separate service rooms. One of which is the washroom with a bathtub in a bold red complementing perfectly with the surrounding green. Each area can be covered with curtains fixed above the floating ceiling for additional privacy. Next to the spaces, a small study area with a white desk outlined in lime green and white chair continue to tie the white and green theme together. Alexandra Christina has a B.A. in Multimedia Communications and English. She is an artist, designer, writer and inventor. She is the founder of Folk Heart Creations - unique, hand-crafted artwork and decor from around the world and Original Source - a holistic health and wellness community. … a decor inspiration blog and everything else to improve your life.